PHUKET: The conspicuous death of Tawatchai Anukul, a fugitive of 13 years wanted for illegally issuing at least hundreds of illegal land titles during his three years as Phuket Land Office Chief ending in 2003, has lifted the lid on a sordid career of corruption at the Phuket Provincial Land Office. The circumstances of his death in his cell at the headquarters of Department of Special Investigation (DSI) in Bangkok within hours of his arrest on Monday (see story here) – have only fuelled speculation that Tawatchai was murdered to silence him. The division between the two lies in that although both the Royal Thai Police and the DSI are law-enforcement agencies, the DSI operates independently under its own executive committee and is akin to the Federal Bureau of Investigation (FBI) in the US. Yet both agencies during different times over the past 13 years have launched their own investigations that have encroached into affairs involving Tawatchai and his accomplices. Tawatchai, a native of Thalang district in Phuket, was accused of having illegally issued land rights documents for more than 1,000 plots of land in Phuket, Phang Nga and Surat Thani provinces, the DSI chief said. In the DSI's announcement of Tawatchai's death on Monday, DSI officials said that the charges aginst the dead suspect included a document for 500 rai overlapping the Khao Lampi-Hat Thai Mueang National Park in Phang Nga. The price of the land was officially estimated at B10.5 billion, and it belonged to a rich person well-known in Phang Nga and Phuket, Col Paisit said on Tuesday. Tawatchai was also accused of aiding encroachment of Sirinat National Park in Phuket and had allegedly issued a land-rights document to a private company for 362 rai of land in Rassada, north of Phuket Town. Among the details revealed in the initial request by the Land Department for the Royal Thai Police Crime Suppression Division in 2003 to arrest Thawatchai were allegations that land-use document SorKor 1 No 29, for land in Moo 2, Tambon Lam Kaen, Phang Nga – on the northern coastal stretch north of Thai Muang – was inflated from 14.0.80 rai to 145.0.80 rai. In Phuket, Tawatchai was accused of assisting in the registration of a “flying SorKor 1” – a technique whereby the paperwork from one piece of land is altered so that it appears to cover another piece of land – by upgrading SorKor 1 No 260 for land in Kamala to NorSor 3 Kor No 1 190, and altered so that it appeared to apply to a different piece of land on Laem Nakalay. He was also accused of the illegitimate issue of the nine Chanote titles No 61483-91, referring to land in Rassada, Phuket. Named as accomplice in several of Tawatchai’s dealings during the halcyon days of Phuket land corruption was former Kathu Land Office Chief Bunchoo Limraksasin. The Criminal Court in Bangkok in November 2006 sentenced Bunchoo to 20 years in prison after finding him guilty on 10 counts of demanding bribes amounting to millions of baht for land titles between December 21, 2001 and March 8, 2003. The court also found his personal assistant, 34-year-old Meena Kalra, a part-time helper at the Kathu Land Office, which also administers land ownership in the tourist hotbed of Patong, guilty on seven counts of conspiring to launder money for Bunchoo. She was sentenced to seven years in prison after police raided her home in Land & Houses Park in Chalong and found her with B17 million in personal savings despite her monthly salary of only B5,000. In the trial against Bunchoo, the court heard that Bunchoo had accumulated B5.4 million from processing land titles for one woman in 2002, including a final payment of B2 million in cash delivered in a gift-wrapped box to Bunchoo by the woman’ s land broker. Both Bunchooo and Meena strenuously denied being involved in an adulterous affair. A warrant was issued for Bunchoo’s arrest after the woman reported him to police, but Bunchoo, who was transferred to Ubon Ratchathani in June 2003, initially evaded arrest. Bunchoo went on the run the same time as Thawachai, but after a manhunt in Phuket and Phang Nga in July that year, Crime Suppression officers finally arrested him in Ranong after his return from the Andaman Club casino and resort in Myanmar – a popular visa-run destination among expats in Phuket at the time. The charges against Bunchoo stated that he transferred more than B17 million to two bank accounts in Meena’s name and bought a B2.1-million condominium for her in Bangkok’s Phaya Thai District. Fellow conspirator Uru Thipthep also formerly of the Kathu District Land Office is still in jail, while Meena is free after completing her seven-year sentence after being convicted on conspiracy to commit fraud, the Bangkok Post reported. In the charges against Phuket developer Boonkeng Srisansuchart that never saw the light of day were a move by the National Counter-Corruption Commission (NCCC) as recently as 2010 to undo corrupt deals dating back to 1997. Apinan Issarangkul Na Ayudhaya, the NCCC Secretary-General at the time announced that Thawatchai was wanted for gross dereliction of duty, criminal misuse of power and document forgery. Those allegations were directly linked into three Chanote title deeds issued to Boonkeng in 2001. Mr Boonkeng, best known for his Srisuchart Grandeview housing development on the bypass road in Phuket, had applied for eight Chanote titles based on a single SorKor 1 title deed covering over 362 rai of land. The NCCC ruled that a survey of the land specified in the document, located along the bypass road on the outskirts of Phuket Town, revealed it to be state forest land. Boonkeng had earlier been evicted from four plots of state land – also along the bypass road, in 2004, and on November 21, 2005 was wounded in a gun attack on the streets of Bangkok. Boonkeng denied he was the target of the attack, as an associate of his, Nimit Pokaphol, a former officer in the Phuket Provincial Land Office (PPLO), was killed in the attack by a round from a .22 firearm. Boonkeng, 57 at the time, was injured in the neck by a single shot and spent time under police guard in a Bangkok hospital before returning to Phuket. 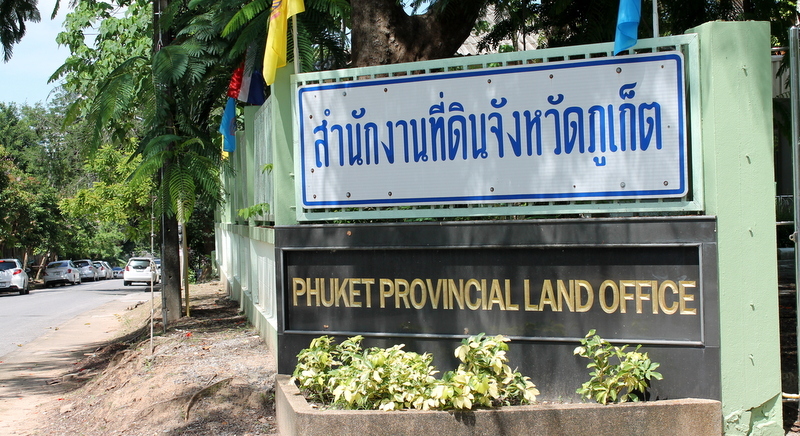 In the unravelling of illegally obtained plots of land in Phuket, the Anti-Money Laundering Office (Amlo) seized four plots of land in the Panturat Hills on the basis the land was SorPorKor state land. It was also alleged that, in 1983, a provincial vice-governor allowed Boonkeng to take out a 30-year lease on the four plots, totalling 76 rai and comprising forest and agricultural land. Mr Boonkeng was said to be planning to use the land to collect water for a development of prestige homes, but the properties were never built. However, police have yet to link Tawatchai’s dealings with the death of Pongtorn Hiranyaburana, Deputy Chief of the Phuket Land Office at the time of his murder, who was shot dead on the way to his home in Surat Thani on April 25, 2003. Police at the time believed the murder to be a clear assassination, as Mr Pongtorn was shot dead literally while behind the wheel while the car was in motion. Tawatchai had transferred out of Phuket to the Thai Muang Land Office in Phang Nga just weeks earlier, after then-Prime minister Thaksin Shinawatra personally appointed Mr Pongtorn to lead the investigation into “suspect land titles” in Phuket. The police failed to bring Mr Pongtorn’s killers to justice. By June 2004, the trail had gone cold, Pol Col Ronapong Saikaew, Superintendent of Investigation of Police Region 8 at the time, said. “We have to investigate more and check to see if the evidence found at the scene is somehow related to other cases [we are investigating]. We need a fresh lead in order to get closer to the people involved,” he told the press. Col Ronapong had announced on November 11 the previous year that officers expected a breakthrough and were closing in on a key person involved in the killing, but the case has since stalled. “We know who the gunmen were, but we don’t have enough evidence [to issue arrest warrants]. The driver fled to the Northeast and the gunmen are likely somewhere in central Thailand. There were at least three people involved in this murder ,” he said. “From the outset, we have assumed that the masterminds are from Phuket and that they are still living here. “I still can’t say when I expect to bring the suspects in for interrogation,” he added. Also Big Buddha Hill needs attention of NCPO, as 2 years ago already it was written in thai press that 'Big Buddha project' did violate chanote boundaries at the construction site. Actually it is strange that nothing, really not 1 concrete section there at Big Buddha complex has been completed. It is everywhere by bits. We all know that. Today a great 'Opinion' in Bangkok Post of Veera Prateepchaikul about the Thawatchai portfolio. A fine last update of reality. “We know who the gunmen were". Why not anonymously name them here so we can spread the word? The best way would be to use S44 and investigate with the help of the Army, all land titles under the supervision and signed by Thawatchai, the former Phuket Land Office registrar Thawatchai Anukul, to revoke manu militari all illegal deeds and demolish all illegal buildings or resorts without pity for greedy influential land-grabbers.